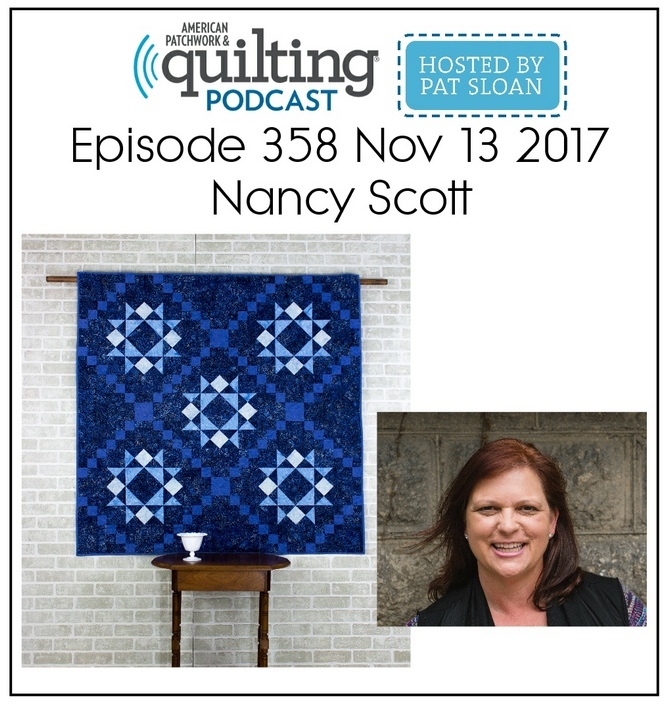 The design has many of the same features as any other modern quilt - lots of negative space and a very strong design element. From the precut 2-1/2" strips, I sorted out the blue strips for the binding, the dark green strips for one chain and gold strips for the other chain and the perfect muted green for when the two chains crisscross each other. 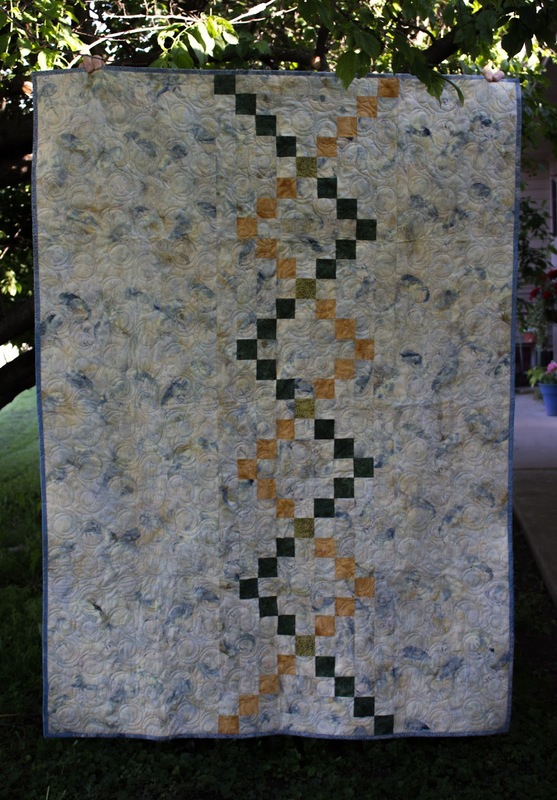 The background fabric features beautiful fish motifs that appear to be swimming around the quilt. And in true confession style - I actually designed and pieced the quilt back in April and it has been sitting patiently waiting to be quilted. While I had a very custom quilt plan in mind, I knew I didn't want to overwhelm the batiks with by quilting them to death - so instead I opted for an overall design that mimics the swirls in the background fabric. 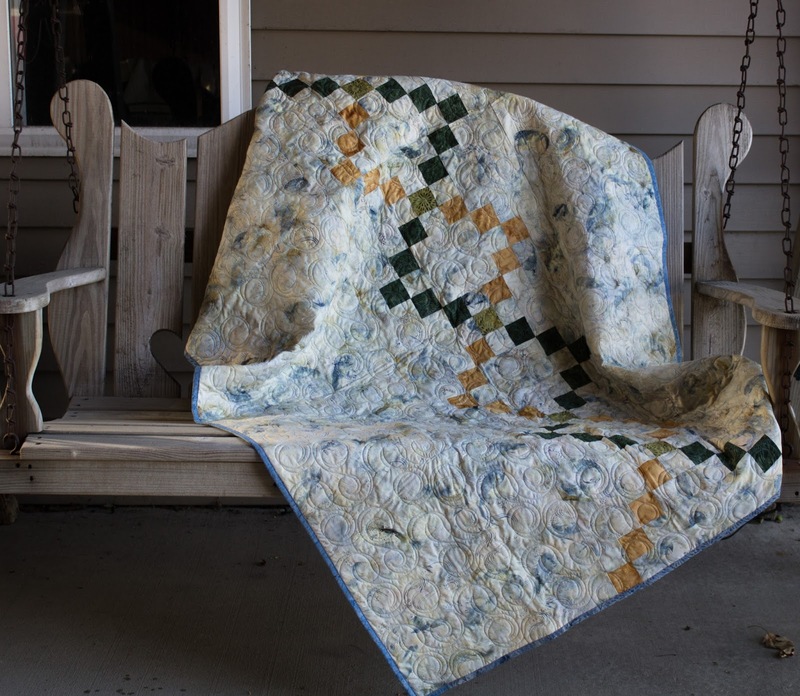 As I was catching a few photos tonight, I decided to drape the quilt on the swing on our patio. I hadn't even thought about how inviting it would look there! As I start this post - I realize I'm not going to be able to share everything I want to in just one post! So here is Part 1 of my trip to Spring Quilt Market! 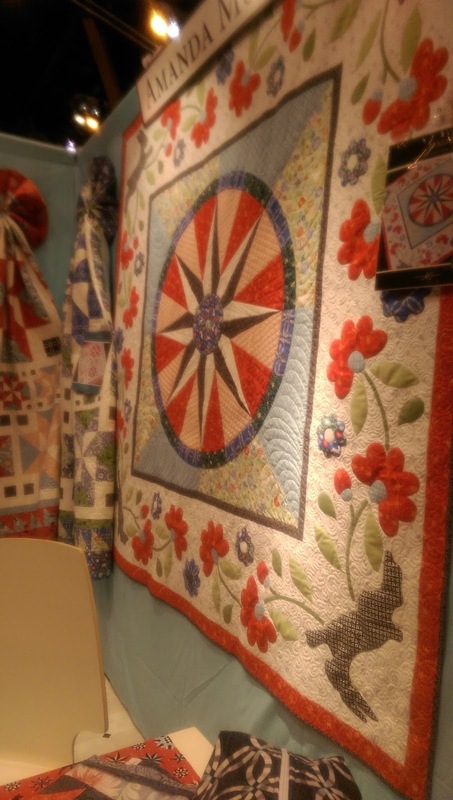 The Market was held in the Convention Center and is a wholesale only show for quilt shop buyers, designers, authors and media. 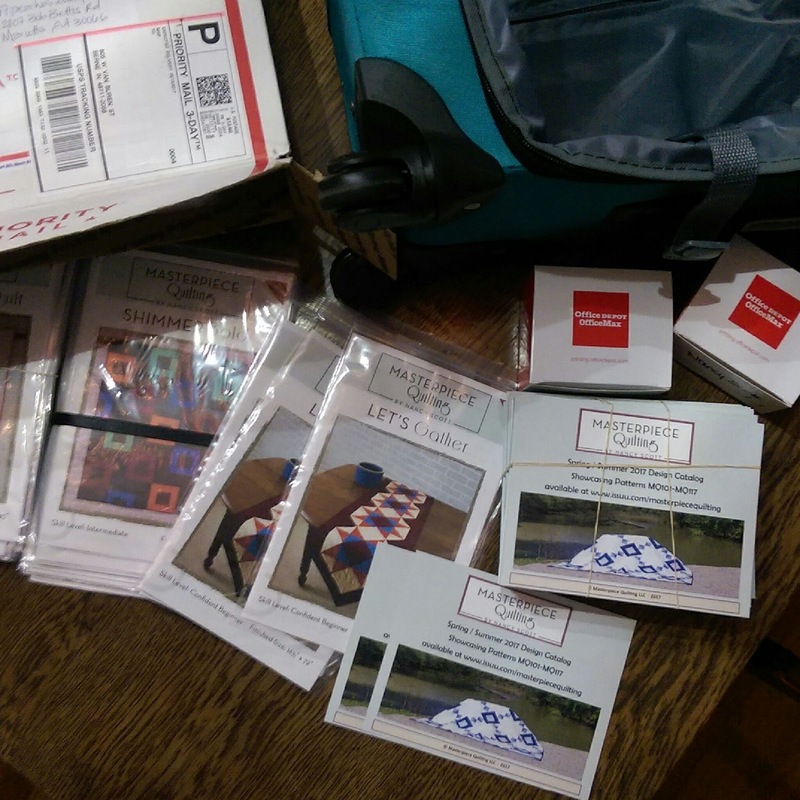 Since I was driving, I wasn't limited on luggage :) so I could take along all my new patterns to share with distributors, quilt shop buyers and fabric companies. Okay - where to start... 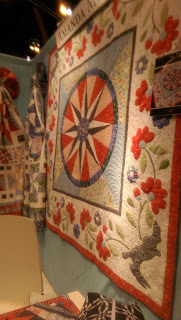 I'm going to share photos of some of the fabric collections, designers and booths that caught my eye. These aren't in any particular order. Ready - let's go! 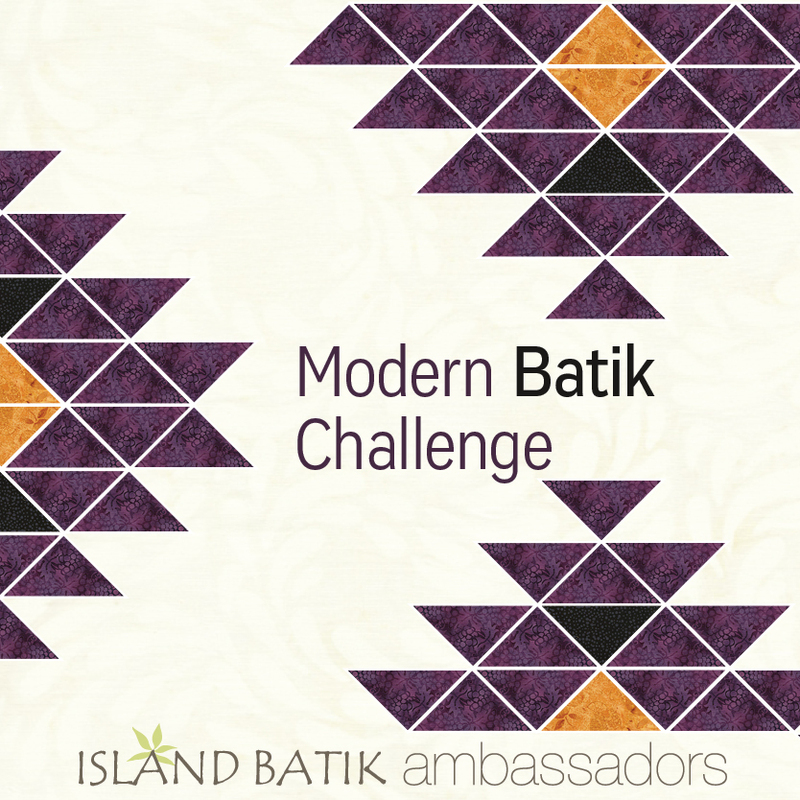 First up - Island Batik ! 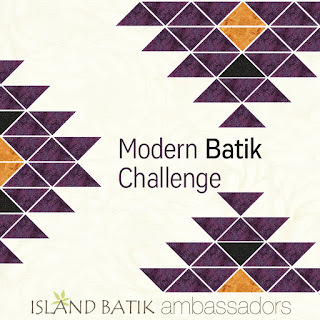 As a brand ambassador for Island Batik, I couldn't wait to see all the new collections in person! 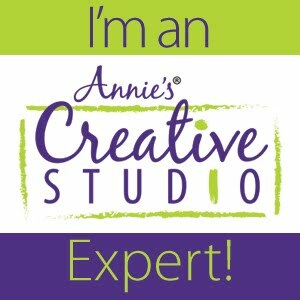 I've been designing with the digital images for several months, but there is nothing like getting to touch, feel and fondle! Next up - Amanda Murphy who designs for Benartex Contempo line. I first met Amanda in Houston a few years and love her designs. 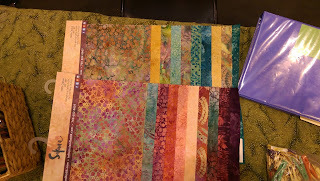 I used her Carina collection in my Learn to Quilt with Precuts Video Class. Here is her latest collection. 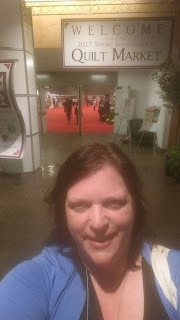 The photo doesn't really do the color justice (convention center lighting isn't the best!) 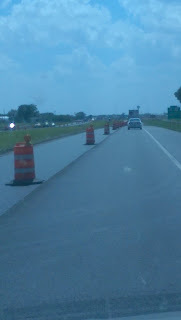 but I love the clean and crispness of the line. Another favorite of mine is The World of Susybee - if you haven't seen these panels, you must take a look! 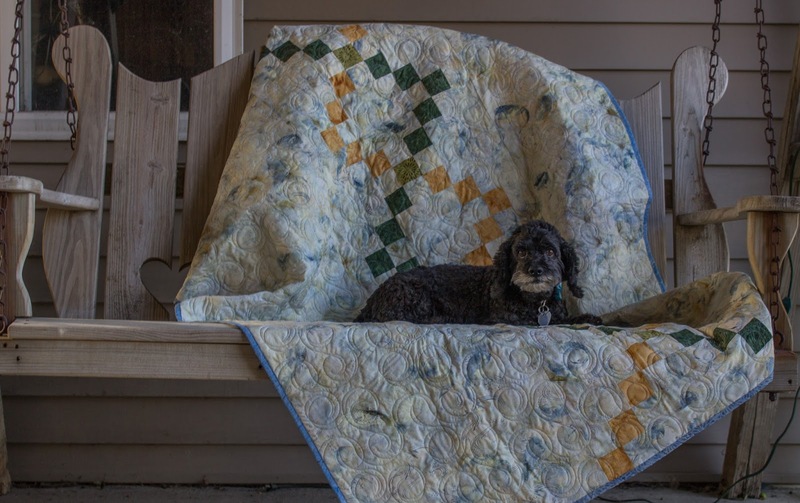 They are so fun, colorful, whimsical but still realistic ... Lyon, the Lion has been my buddy lately as I as used him in my Learn to Quilt with Panels Video Class as well as a new trio of designs that will be released soon - so stay tuned! 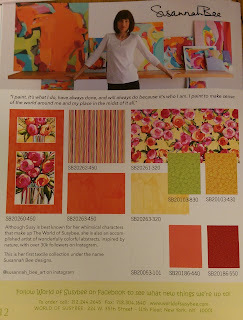 I am enamored with the new Susannah Bee line - the florals are oh, so gorgeous! I did take some time to slip away to walk down to the Arch ... 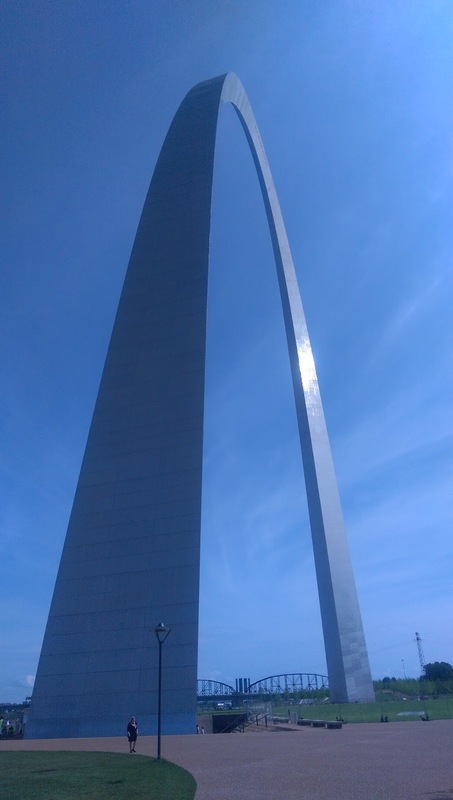 I had only driven by it, but had never stopped to see it in person. 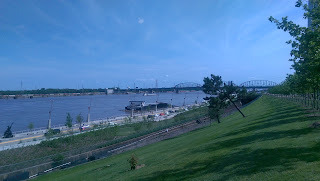 It was neat to watch the river and see the barges as they moved along. To wrap up Part 1, I want to share one of my favorite designers... 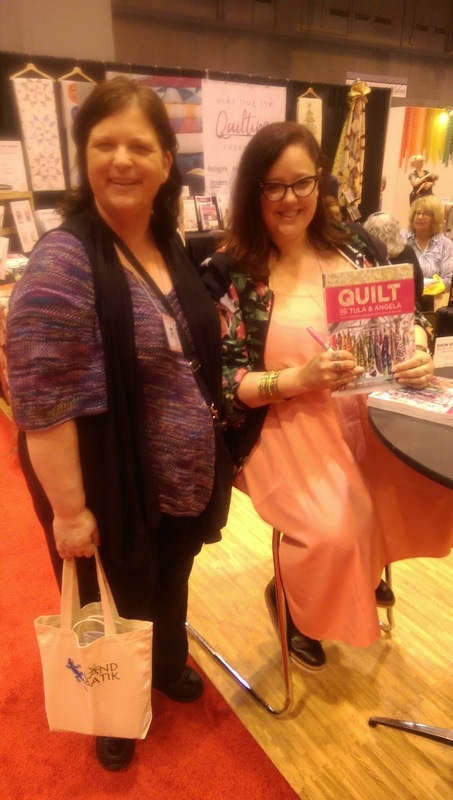 I have heard her speak at several conferences and behind the amazing designs that we see on fabric is one of the most talented, businesswomen I have ever met - Tula Pink. Her new collection is Spirit Animal. I'm not going to address any of the negative hub-bub related to the collection - it's not my place and other's have discussed it in length. 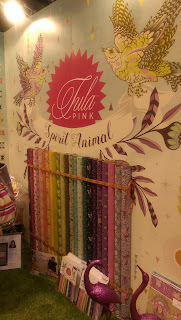 The fabrics typical Tula - bright colors that play well together but strong enough to stand on their own. 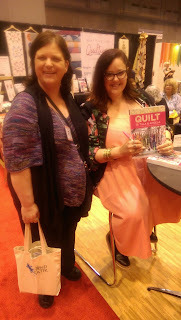 And as an added bonus - I was able to get a signed copy of Tula & Angela Walter's new book, Quilt with Tula & Angela. Photo Cred: Tula's amazing brother & social media genius Cameron. 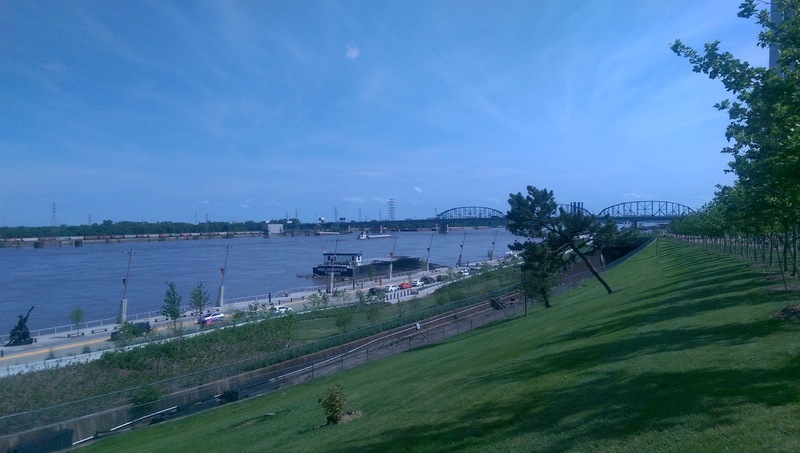 So that's all for now - stay tuned for Part II ... and maybe even Part III!